Pink Castle Fabrics kindly donated that beautiful bundle to sponsor the Mod Pop Quiltalong, where a bunch of brave and courageous quilters are making Julie from Distant Pickle's Mod Pop Quilt with me. 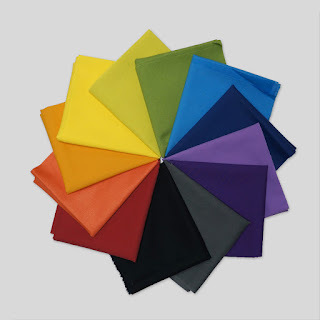 The rainbow bundle was the incentive to get over the fear and worry of sewing curves. Thank you to Brenda and the gang at Pink Castle Fabrics. I counted them in order from the first block posted by each person, and the winner is Anne. She is asdesigned on flickr and she blogs at Play Crafts. Congratulations Anne - her blocks are those beautiful deep blue/navy and grey ones. It is not too late to join us, we are all going to piece these fun blocks for a bit. In other quilty news, I forgot to show you the key fob that I made for my secret partner in the Mouthy Stitches Swap. A small little thing but so cute. I used the pattern by Leila from Where the Orchids Grow. I am going to make some more, these would make great little presents and the holidays are coming. I am going to send the beautiful Marmalade hexies to Helen who blogs at Archie the Wonderdog. She has a nice pillow planned for her front room. Much better, of course one can take control of one's palette, right? Now I have to get on with some English Paper Piecing for the Travelin' Pic Stitch Blog Hop. My day is November 5 but I am not so great at EPP and will need the time. In the meantime, there is a new EPP block every day in this blog hop, the list is here if you have been missing the fun. It is a working day, time to get a move on. Second of all, you don't have to crop the picture ahead of time. :D See those square boxes in the corner of the palette builder tool? You can drag them inwards and it will crop the photo for you. If you click in the middle of the box and move it around, you can move the crop area where you want. It will make more sense when you try it, I hope! I love the palette you made! And thanks again for hosting such a fun QAL, AND getting me over my fear of curves! Yay for those hexies going to Helen. And to the wonderful different versions of the QAL happening. Congrats to Anne! I LOVE her Mod Pop!! 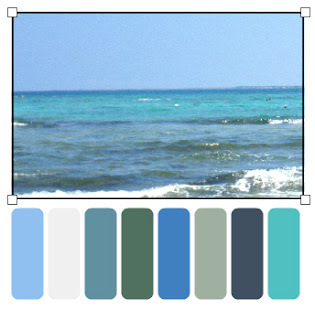 And I also am in awe over how you cropping your Hawaii pic made such a difference in the palette - very fun! Congrats to Anne and to all those amazing Mod Pop Makers!!! Thanks again Leanne, for hosting this qult-along! Yippee for Helen's hexies. The key fob is just super - would love to give this design a try. And hip hip hooray for Anne! All the Mod Pop blocks are wonderful (really, really need to get some things off my list so I can start!) - they're all so different and I can't wait to see what the quilts look like! Anne congratulations! Super to win this fabric. Thank yoe Leanne for this fun QAL! What wonderful variety in the Mod Pop blocks! Great to see them all together! The palette builder is great fun, isn't it! Looking forward to seeing your EPP project! Wow - Anne's palette is beautiful but then they all are. Yeah for the hexies going to lovely Helen - hope there will be a biscuit for Archie. Helen will make something wonderful with those hexies. 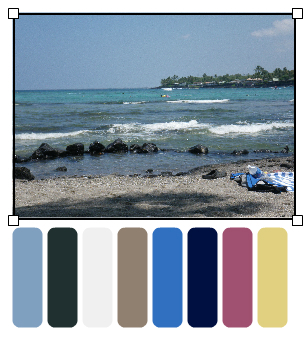 I had a great "play" with the same palette maker.